To most of us rugby lovers the Six Nations is rather like Christmas as a child. We look forward to it from a distance, talk about it incessantly, count down the days until it is with us and then it is over all too soon. What will we do now? Well, there is always the European Rugby Cup and Judgment Day to look forward to, but that is another matter. I think that in this review it is better to opt for the Olympic medal presentation format and go in reverse order. Italy have been the perennial whipping boys since they joined the tournament and this year was no different as they suffered another catalogue of defeats. It was uncomfortable viewing to watch such a great player as Sergio Parisse suffer the ignominy of being the first person in the history of the game to have suffered one hundred test defeats. Such is the poverty of the Italian game. They can at times, as they did in their last match, raise their game to play as best as they possibly can and hope that the opposition, as Scotland did, play the worst that they possibly can and they just might get a result. The result this time being a losing bonus point, the only point that they could muster. This surely is not enough, I have postulated in a previous report that it must be time to consider relegation in this tournament and a method for so doing, I shall not repeat myself now. England were like the old saying about the month of March, coming in like a lion and going out like a lamb. They were the strong pre-tournament favourites, deservedly being rated as the second-best team in the world, and looking, as Eddie Jones had commented, to make history. They seemed to be on track after two rounds and two wins, but then it all unravelled. Three losses in a row followed including a rare defeat, in recent times, at Twickenham. After the last World Cup, the English mantra seemed to be that good players do not become bad players overnight. Eddie Jones took over and with substantially the same set of players turned them into a team that ran up 18 consecutive victories and pre-tournament had won 23 of their last 24 fixtures. Their last three games have exposed their underlying frailty and maybe the mantra should be that good players do not become great players overnight. Eddie Jones had brought them confidence and imbued them with an air of invincibility (All Blacks aside) but that mantle has fallen away, their confidence dissipated and they now have an air of beatability about them. With the world cup looming next year Eddie Jones faces his toughest England challenge yet. France have put the spring back into their step. They played with the joie de vivre that we had become used to in the past, and while only two wins in the tournament is not really much to shout about from the top of the Sacre Coeur, they could have easily had two more. The home defeat against Ireland, whilst gut-wrenching for the supporters and the team, served to rekindle their self-belief. It seemed to force the team into re-adopting their can do/can win attitude. Whilst it seemed a kick start for France they still need to travel away much better than they did against Scotland and a defeat followed. Victory over Italy and a much welcomed and joyous win over England in Stade De France put the air back into their tyres. Against Wales, in their final match, they could not quite make it, but they do look as if they could become the force of old in time for the World Cup. Scotland seemed to want to vie with France for the title of the most unpredictable team in the tournament. We really did not know which Scotland would turn up. It was a topsy-turvy campaign for them. They had a tremendous set of Autumn Internationals and in their first game travelled to Wales with great hopes for the tournament, how they failed, it was as if they had forgotten everything that they had learnt about how to play rugby. This defeat, however, gave them the reality check that they needed and a hard-fought victory over France at Murrayfield set them in good stead to face England at the same venue nearly two weeks later. For many it was the best game of the tournament, Scotland defied the pre-match odds and posted a thrilling victory that will live long in Scottish hearts. They followed that up by handing the following game to Ireland in Dublin, they squandered chances and by some counts left three tries out on the pitch. In Rome, they squeaked a win against Italy and earned them the title of the team that neutrals would least like to be a supporter of. How I feel for the Scottish fans. Wales have much to reflect and learn from their experiences. Warren Gatland must be pleased with the strength in depth that has been discovered, Wales now have about 30 or so players that can be called on to play test rugby. The campaign started brightly enough with a good win against Scotland at home. A bitter and arguably a controversial defeat to England at Twickenham followed by another loss in Dublin against an Irish side that dominated possession but ultimately had to wait until the end of the game to ensure victory, left Wales rueing their missed opportunities in both matches. A routine win against Italy at home left Wales pursuing second place in the championship in their final game against France. It was a gripping match and Wales under pressure for so long in the second half managed to hold on to win and take a second place which seemed unlikely after the first three rounds. Warren Gatland should feel a certain amount of optimism as he prepares for next year’s World Cup, a number of Lions to return, the new faces acquitting themselves well and the team at times playing with pace, depth and expansiveness. The real problem that he faces is to decide how he wants to play in the future and who he wants to choose to do it. Ireland set the groundwork for their Six Nations and Grand Slam championship with a tenacious performance in Paris in the first round of the tournament. They looked all but beaten at 80 minutes, they retained their discipline and recycled for what seemed an age, then Sexton’s drop goal started them on their journey. 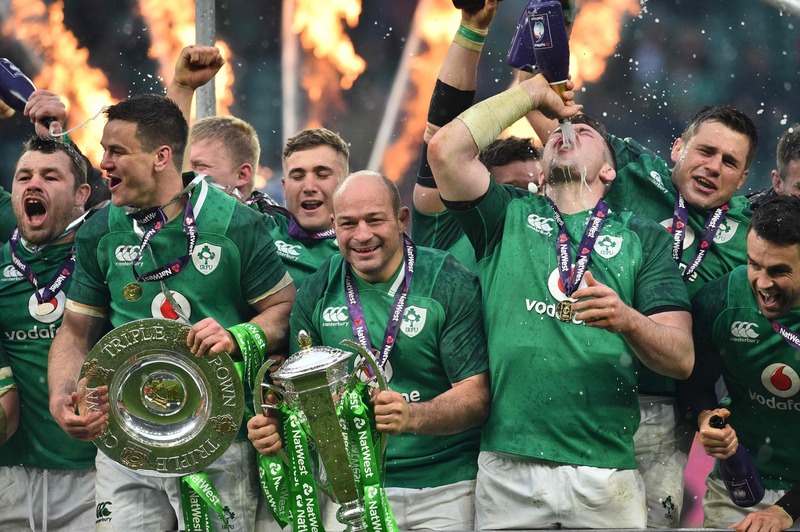 A facile win over Italy and victory over Wales in Dublin and it seemed that the fates had decreed that they would play at Twickenham on St Patrick’s day for the Grand Slam. When Scotland decided to gift them the game in Dublin and after a great Cheltenham Festival with 17 Irish winners, it was inevitable that they would achieve the dream. So it was, Ireland never really looked threatened against a workaday England side that had run out of ideas on and off the pitch. I am sure that the celebrations went on long and deep into the following days, and who is to say that they are not still scraping them up off the streets in TW3 and Dublin at this very moment. I doubt that this Irish team will go down as one of the best sides ever to win the Grand Slam, but it would be churlish to begrudge them this achievement as this was only the third time in the history of the competition – either as Home Nations, Five Nations or Six Nations, that the Irish have been in this position and you can only beat what is placed in front of you. It is surprising though, given that most of the teams were so evenly matched that there was a Grand Slam at all, it could be argued that a different bounce or a slower or faster or more accurate pass could have changed any of the teams’ number of wins for better or worse. It is the grain of rice that tips the balance or Al Pacino’s inches that makes the difference. Whatever, it has been fantastic, from the first to the final whistle the Six Nations has kept us on the edge of our seats. Finally, I would like a bit of self-indulgence and give you my favourite part of the competition. This was Wales’ second-half defensive display against France. We all love flowing rugby, the 70-metre breaks, the slick passing interchanges, players of great talent ghosting through defensive lines, but for me, this epitomised all that is great about our game. Wales, under phenomenal pressure, to a man dug deep to defend in adversity and showed the qualities other than skill that are required to play this game: courage, commitment to your team, the tenacity not to give in when giving in would be the easiest option, to be willing to place yourself and your body on the line for the cause. This is what sets rugby apart from any other sport and rugby players apart from any other sportsmen, skill only is not enough. This is the best lesson that rugby teaches its players, it is a lesson for life, it is a lesson that gives a compass as to how to comport yourself in the greater world. When the final whistle went against France I was filled with pride, exultation and an immense feeling of well being that still persists.